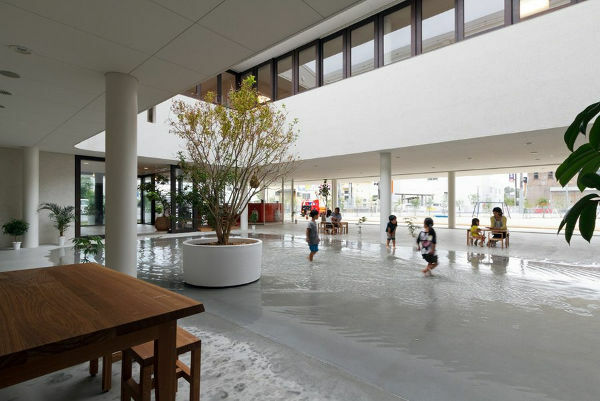 The Japanese preschool creating a splash! Kids and puddles of water – match made in heaven, right? 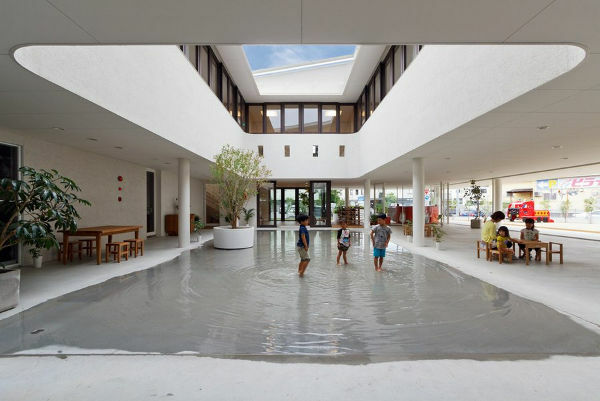 How about a preschool designed to capture water, that becomes a giant puddle to play in? Yep, it’s perfection. 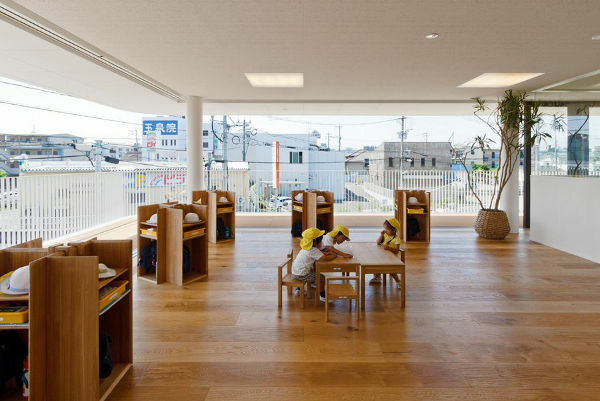 Japan is home to some of the most amazing children’s spaces we’ve ever seen. There’s the kindergarten that’s built to withstand typhoons and the brilliant shopping centre playground in Tokyo. 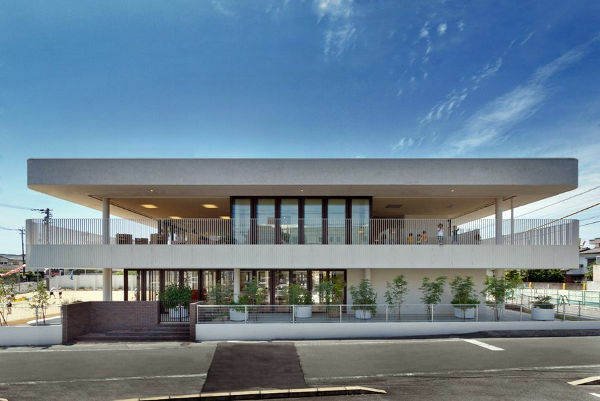 And we can add another creation to the list – the utterly fabulous Dai-ichi Yochien preschool in Kumamoto City. 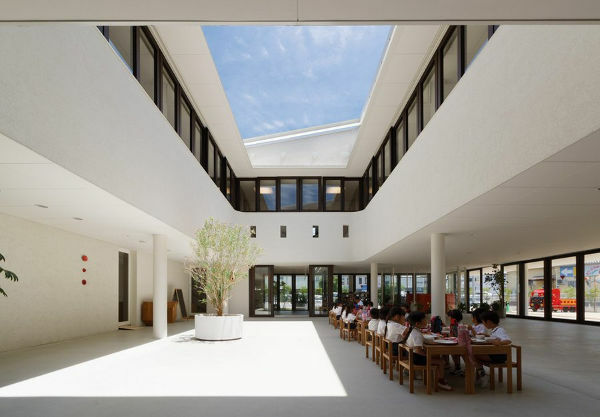 The courtyard of this stunning preschool is designed to capture rain water. A downpour of rain doesn’t mean no play for these kids – it means a giant puddle to splash around in. The area is particularly versatile. When it’s dry it can be used as a badminton or softball court, and in the winter it can even be used as an ice skating rink. But it’s not just this unique area that sets this kinder apart. The building’s open floorplan is aimed at creating an environment perfect for learning in a flexible way. The furniture is used to partition areas and create ‘classrooms’. And how is this for an inspired idea: each child purchases their own desk and chair, which they take with them when they graduate. It means that there’s always new furniture at the school, keeping it fresh.